Casino games are one of the fastest growing segments in the mobile gaming sector. According to industry observers this growth is due in large part to the more robust capabilities of mobile devices. The social network component of many of the casino games is the other major growth factor. 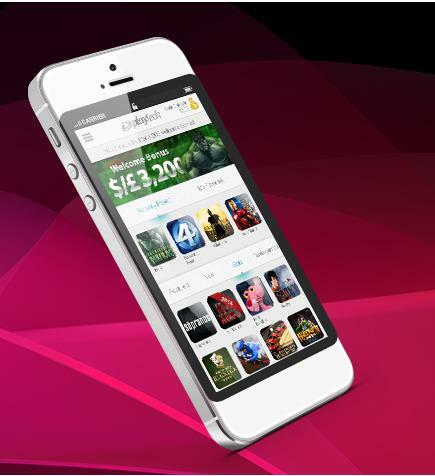 Two other trends are also emerging due to the increased popularity of casino games with mobile and PC gamers. The first trend is an increased in the number of players playing the traditional table games such as blackjack and roulette, with a decline in the number of slot players. This trend is easy to understand as the table games are far more immersive. Simply pushing “spin” repeatedly is not the most engaging of activities. The table games give the players options in terms of betting and other actions. The table games allow players to develop and test strategies. Players are also using the computer games to learn how to play the game prior to visiting a brick and mortar casino. For decades casino visitors have said they avoided the table games due to being slightly intimidated and the wish to avoid embarrassment by not knowing the rules. In interviews a large percentage of players, especially female players, have stated they learned how to play on their computers or via mobile apps. The online casino games have much lower betting limits and there is no peer pressure. Blackjack has long been one of the most popular games in the casino and is the game most likely for new players to try as they move from the slots. The value of learning the game online is readily apparent. First online sites offer extensive tutorials and strategy tips. EuropaCasino’s blackjack section is an especially good example, as the site offers one of the most comprehensive guides to the game that can be found. How to Play – As the site points blackjack is one of the easiest games to play. They quickly point out one of the common misconceptions about blackjack, namely that the object is to beat the dealer, not to get 21. Blackjack Math – Like most casino games, blackjack is based on mathematical concepts. While you don’t have to be a math wizard to play the game, understanding the basic math behind blackjack will give you a better understanding of basic strategy and how to maximize your chances of winning. Tips from John Grochowski – This is one of the most valuable sections of the site. Grochowski is the author of a weekly syndicated column on gambling, host of a weekly radio show, book author and gaming consultant. His advice is easy to understand and it works. Blackjack history - Blackjack is one of the oldest games in the casino. The game’s origins date back to 19thcentury France and has changed little since its beginning. The history behind the game and some of the games historic devotees is fascinating, but has no effect on your ability to learn how to play. Blackjack in books and movies – Due to the fact that even non-players understand the basics of blackjack; the game has been part of the plot of a number of books and movies. The guide gives readers a look into some of their favorites and possibly provides some new viewing and reading suggestions. Terminology – Every casino game has its own terminology. Some games, like craps and poker, almost sound like a completely different language; not so with blackjack. The terminology is fairly straightforward and is laid out in a clear concise manner that will have even the newest player talking like a pro. Blackjack variations – While the basic game remains relatively unchanged since its beginning, casinos have introduced a few variations over the years. These variations provide some interesting and fun options not found with standard blackjack; some even include jackpot opportunities. 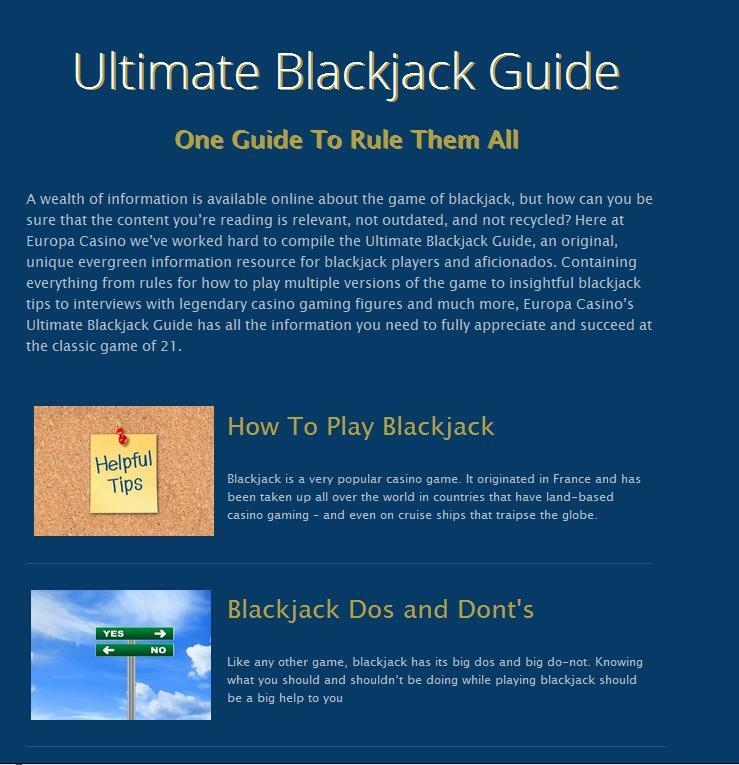 The site explains games like Blackjack Switch, Blackjack Surrender, Blackjack Attack and Blackjack Pro and the rules and strategies unique to those variations. The EuropaCasino blackjack guide is without a doubt one of the more complete guides to be found on the internet, especially since the information is available for free. Whether you are trying to learn the game for a future real-world casino visit, or are just looking to play at the virtual tables, it is worthwhile and interesting reading.